Boeing's CST-100 Starliner is a spacecraft under development for NASA's Commercial Crew Program. 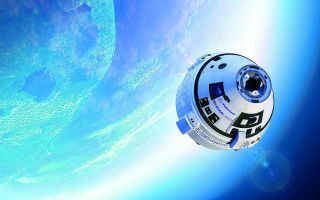 The space agency plans to use Starliner, as well as SpaceX's Dragon, to take astronauts to the International Space Station by 2019 or 2020. Uncrewed test flights are scheduled for August 2019, with crewed test flights tentatively set for November 2019. The Starliner is similar in shape to the Apollo spacecraft, but its electronics are half a century more advanced. The spacecraft is designed to carry up to seven astronauts, with additional cargo also possible if fewer astronauts fly in a particular mission. Measuring 14.8 feet (4.5 meters) across at its widest point, the gumdrop-shaped spacecraft will first fly into space aboard Atlas V rockets. Money for the development of the spacecraft largely came through NASA's commercial crew program, which aims to replace the Russian Soyuz spacecraft flights required to take astronauts to the International Space Station. In one phase of the program, called Commercial Crew Transportation Capability (CCtCap), Boeing received $4.2 billion in September 2014. Competitor SpaceX received $2.6 billion for its Dragon spacecraft. NASA is hoping to relaunch astronauts from American soil, which has not been possible since the space shuttle retired in 2011. The program has been pushed back several years, NASA has said, due to Congress not allocating as much money as what the agency requested. In 2011, the company put a 12-by-14 inch model of the CST-100 in a wind tunnel to determine the spacecraft's aerodynamic characteristics. The model was placed in several different positions to simulate different phases of an abort-mode landing. In 2012, Boeing did parachute drop tests of the CST-100 to determine how well the spacecraft's parachutes and air bags worked. Unlike the Apollo missions, the CST-100 will touch down on land, making the air bags especially important for the job. Later in the year, the company and NASA determined what would be the basic layout of the spacecraft, which NASA considered an important milestone under the third round of CCDev. In 2014, Boeing unveiled a full-scale mockup of the spacecraft at the Kennedy Space Center, showing the inside of it for the first time publicly. Airbag testing of the spacecraft proceeded successfully in February 2016, and in March 2017 it underwent a successful parachute test in the New Mexico desert. Also in 2017, Boeing unveiled the spacesuit astronauts will wear aboard the Starliner. The spacesuit features several advancements over previous spacesuit designs. It is smaller and lighter, and includes special gloves designed to allow use with touchpad screens. Due to a problem during an abort engine test in June 2018, Boeing announced in August that test flights would be pushed back to 2019.